There are still random listserv mentions of hosted Messier Marathons among some of the local clubs. Be sure to check your local astronomy club to see if any events are being scheduled. I wasn’t sure if the article was going to come out before or after the Tiangong-1 final descent, so kept the opening discussion of potential problems with things “up there” general. On top of some excellent planetary viewing this month, The Lyrids make their yearly return, then we continue to zodiac discussion with Gemini – perfectly placed in the western skies this evening for some strain-free scope and bino observing. The good, the bad, and the potentially ugly things that fall from space. 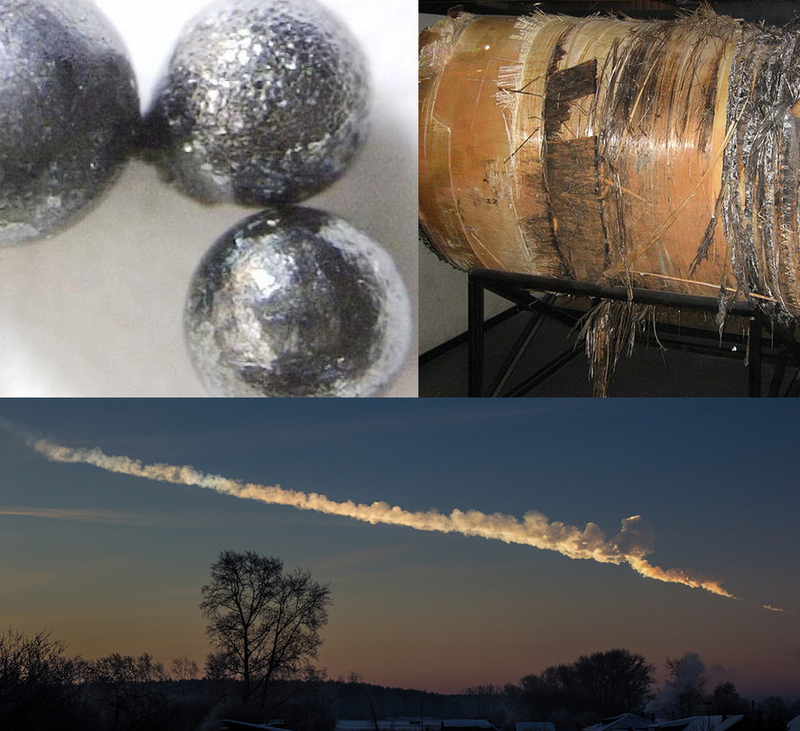 Micrometeorites (IFLScience.com), a SkyLab fragment (from wikipedia), and the Chelyabinsk meteor trail (Alex Alishevskikh). When asked to list the contents of our Solar System, some stop at the Sun, planets, and moons. Others will remember comets – a list of objects that grows much longer every year. For those looking for up-to-date info, see minorplanetcenter.net – we have comfortably cleared the 4000 comet mark. Some may add the asteroid belt – a region between Mars and Jupiter which looks less like the chaotic debris field from “The Empire Strikes Back” and more like oases of larger rocks separated by vast, empty deserts of tiny particles. Don’t forget the currently 18,000-long list of NEOs, or Near-Earth Objects. These are among the more than 18,000 reasons why the late-great Stephen Hawking and others have championed the need for colonization beyond the Earth’s surface. Changing positions in the sky is one thing – changing elevations is very different. Occasional bright flares make the news when captured on video. Events like Tunguska and Chelyabinsk remind us that there thing in space we might miss that could level cities. We are fortunate that most of the roughly 160 tons of debris from space that hits the Earth *each day* is in the form of micrometeorites that you could start collecting with a strong magnet and a flat rooftop. The highly-anticipated demise of the Tiangong-1 over the weekend was a reminder that we may not be able to always rely on the “dilution-solution” of handling our garbage. Our planet is large, spherical, mostly covered in water, and largely unpopulated – but the number of satellites going to space will only increase as launches get cheaper. It remains to be seen if nations will opt to address the dangers of space junk before or after something serious – and unavoidable – happens here on the ground.